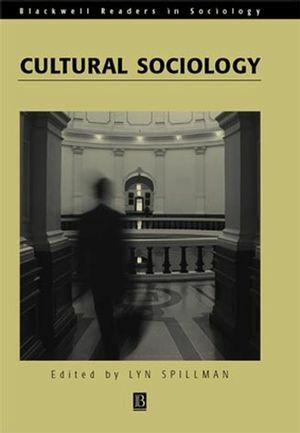 Cultural Sociology collects 31 seminal essays by renowned social thinkers that introduce cultural sociology to an emerging generation of students and scholars. Lyn Spillman is an Associate Professor of Sociology at the University of Notre Dame. She is the author of Nation and Commemoration: Celebrating National Identities in the United States and Australia (1997) and a recipient of a Guggenheim Fellowship in 2001..
Introduction: Culture and Cultural Sociology: Lyn Spillman. Part I: Analyzing Culture in Society: Key Ideas:. 1. The Diversity of Cultures: Ruth Benedict. 2. The Metropolis and Mental Life: Georg Simmel. 3. The Culture Industry: Enlightenment as Mass Deception: Max Horkheimer and Theodor Adorno. 4. Center and Periphery: Edward Shils. 5. Base and Superstructure: Raymond Williams. 6. Thick Description: Toward an Interpretive Theory of Culture: Clifford Geertz. 7. Cultural Power: Pierre Bourdieu. Part II: Cultural Repertoires: Identities and Practices:. 8. Boundary Work: Sculpting Home and Work: Christena E. Nippert-Eng (Illinois Institute of Technology). 9. Corporate Culture: Gideon Kunda (Tel Aviv University). 10. Symbolic Boundaries and Status: Michèle Lamont (Princeton University). 11. Symbolic Exclusion and Musical Dislikes: Bethany Bryson (University of Virginia). 12. Raced Ways of Seeing: Darnell Hunt (University of Southern California). 13. "Close to Home": The Work of Avoiding Politics: Nina Eliasoph (University of Wisconsin-Madison). 14. How Culture Works: Perspectives from Media Studies on the Efficacy of Symbols: Michael Schudson (University of California, San Diego). Part III: Cultural Production: Institutional Fields:. 15. Market Structure, the Creative Process, and Popular Culture: Toward an Organizational Reinterpretation of Mass-Culture Theory: Paul DiMaggio (Princeton University). 16. Why 1955? Explaining the Advent of Rock Music: Richard A. Peterson (Vanderbilt University). 17. Art Worlds: Howard S. Becker. 18. American Character and the American Novel: An Expansion of Reflection Theory in the Sociology of Literature: Wendy Griswold (Northwestern University). 19. Behind the Postmodern Façade: Architectural Change in Late Twentieth-Century America: Magali Sarfatti Larson (University of Urbino). 20. The Vietnam Veterans Memorial: Commemorating a Difficult Past: Robin Wagner-Pacifici (Swarthmore College) and Barry Schwartz (University of Georgia). Part IV: Cultural Frameworks: Categories, Genre, and Narrative:. 21. The Fine Line: Making Distinctions in Everyday Life: Eviatar Zerubavel (Rutgers University). 22. The Discourse of American Civil Society: A New Proposal for Cultural Studies: Jeffrey C. Alexander (University of California, Los Angeles) and Philip Smith (University of Queensland). 23. Cultural Form and Political Meaning: State-Subsidized Theater, Ideology, and the Language of Style in Fascist Italy: Mabel Berezin (University of California, Los Angeles). 24. Deciphering Violence: The Cognitive Structure of Right and Wrong: Karen Cerulo (Rutgers University). 25. Civil Society and Crisis: Culture, Discourse, and the Rodney King Beating: Ronald N. Jacobs (University at Albany, State University of New York). Part V: Social Change and Cultural Innovation:. 26. Constructing the Public Good: Social Movements and Cultural Resources: Rhys H. Williams (Southern Illinois University). 27. The Search for Political Community: American Activists Reinventing Commitment: Paul Lichterman (University of Wisconsin, Madison). 28. Cultural Power and Social Movements: Ann Swidler (University of California, Berkeley). 29. A Theory of Structure: Duality, Agency, and Transformation: William H. Sewell, Jr. (University of Chicago). 30. Communities of Discourse: Ideology and Social Structure in the Reformation, the Enlightenment, and European Socialism: Robert Wuthnow (Princeton University). 31. Postmodernism, or The Cultural Logic of Late Capitalism: Fredric Jameson (Duke University). "Lyn Spillman has rendered an enormous service to one of the most important developments in American social science, the full incorporation of the cultural dimension into its frameworks of analysis. It will be extremely valuable for students and for the profession as a whole." Vera Zolberg, New School University. Collects 31 articles by renowned scholars illustrating key ideas in the canon and the currency of cultural sociology. Surveys the most important approaches and developments in the field. Contains an editor's introduction and notes on further reading after each essay.